The original Lady Haig Poppy Factory was opened in March 1926, employing men who had been disabled during World War 1 to make poppies for Scotland. We moved into the Warriston Road factory in 1965 and currently have a work force of 40 ex-Servicemen, the large majority of whom are registered disabled. While we are a commercial organisation, we are also a charity that provides dignity through work. Many of our workers have been with us for many years and there is a palpable feeling of the military about the place that provides a comfortable and secure atmosphere, for both visitors and workers alike. We work hard to ensure it remains primarily a happy and productive place. We are about to undertake a major renovation of the factory and will move to temporary premises in December 2018. We will continue to trade as normal and contact details will remain the same. Regular updates will be posted here as we go. 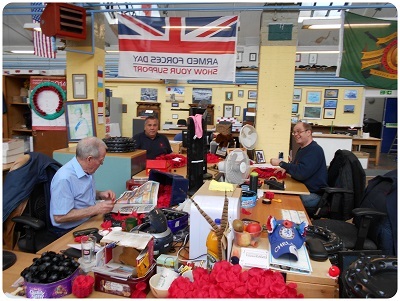 As well as the five million poppies that are handmade each year, we also produce over 12,000 wreaths to order. We process over 25,000 collection tins and make up and dispatch orders to Poppy Appeal Area Organisers all over Scotland. We also make Remembrance Crosses, Long Stemmed Poppies and Dress Poppies, for sale to the public via the factory.